Description: Wingspan 36-45 mm. 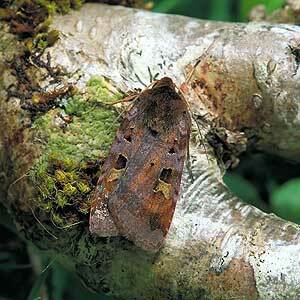 Forewings are purplish brown, broad and well-arched, especially in the male. Forewings are marked with pale stigmata, a conspicuous black mark between the two stigmata and poorly-defined crosslines. Hindwings are greyish brown with a golden sheen and paler fringe. Similar Species: D. dahlia, which lacks the black mark between stigmata and the darker subterminal line. Flight Period: Beginning of June to mid-August. Status: Widely distributed throughout all counties, but more frequently encountered in Down and north Armagh. In Fermanagh it has been recorded recently from several sites including Crom, Carrickyheenan, Carganamuck, Garvary Wood and Brookeborough. Ecology: A species typically found in deciduous woodland, although it has been recorded from some suburban gardens and several bogs. Adults come frequently to light in small numbers. The larvae feed from September to late spring on Bilberry Vaccinium myrtillus, willow Salix spp. and birch Betula spp. It overwinters as a larva. World Distribution: Widespread throughout western Europe.